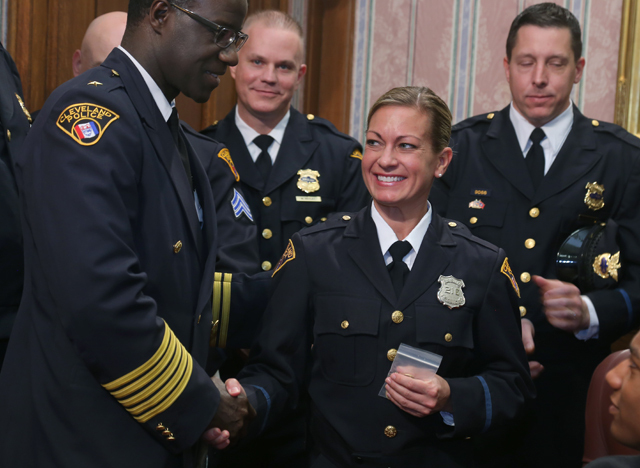 Today, Mayor Jackson administered the Oath of Office to newly appointed police supervisors. These new supervisors included: one Captain, four Lieutenants, and three Sergeants. Lieutenant James P. Purcell was sworn-in as a Captain for the Division of Police; Sergeants Michael J. Betley, Brian P. Carney, Andrew F. Desantnik, and Sammy R. Morris were sworn-in as Lieutenants for the Division of Police; Police Officers James D. Bryant, Jennifer A. Ciaccia, and Robert M. Ricketti were sworn-in as Sergeants of Police. Michael J. Betley was appointed to the Division of Police in April of 1996 and was promoted to Sergeant of Police in May of 2008. His recent assignments include service at the Second, Third and Fourth District. Lieutenant Betley has received a Letter of Commendation from former Chief Michael McGrath. Brian P. Carney was appointed to the Division of Police in April of 2001 and was promoted to Sergeant of Police in April of 2008. Lieutenant Carney’s recent assignments include service at the First, Third and Sixth District and The Chief’s Office. Lieutenant Carney has earned Letters of Commendation from former Chief Michael McGrath and the Chief’s Commendation from Chief Calvin D. Williams. He has a Bachelor of Science Degree in Criminal Justice and a Master’s of Science Degree in Management. Andrew F. Desantnik was appointed to the Division of Police in June of 1993 and was promoted to Sergeant of Police in July of 2012. Lieutenant Desantnik’s recent assignments include service at the Fourth, Fifth and Sixth Districts, Security Service and Police Academy. Lieutenant Desantnik has received a Chief’s Commendation Letter from former Chief Michael McGrath. Sammy R. Morris was appointed to the Division of Police in October of 1988 and was promoted to Sergeant of Police in August of 2001. Lieutenant Morris’s recent assignments include service at the Third and Fourth Districts, Personnel Unit, Internal Affairs and The Mayor’s Security Detail. Lieutenant Morris has received a Letter of Appreciation and Commendation from former Chief Edward Kovacic, a Letter of Commendation from former Chief Martin Flask, the Special Commendation Award from former Chief John Collins, and a Medal of Heroism from Chief Patrick Oliver. James D. Bryant was appointed to the Division of Police in October of 2007. Sergeant Bryant’s recent assignments include service at the Fifth District. Sergeant Bryant has been awarded the Medal of Heroism, Distinguished Service Medal, two Special Commendation Awards, a Chief’s Commendation and a Letter of Commendation from former Chief Michael McGrath. Jennifer A. Ciaccia was appointed to the Division of Police in September of 1998. Sergeant Ciaccia’s recent assignments include service at the Third, Fourth and Fifth District, the Chief’s Office and time as a Police Officer with Cleveland Metropolitan School District. Sergeant Ciaccia has received a Letter of Commendation from former Chief Martin Flask and a Medal of Heroism from former Chief Michael McGrath. Sergeant Ciaccia holds a Bachelor’s Degree in Public Safety Management from Cleveland State University. Robert M. Ricketti was appointed to the Division of Police in August of 1996. Sergeant Ricketti’s recent assignments include service at the Third and Fifth District. Sergeant Ricketti has received a Chief’s Commendation from former Chief Edward Lohn.